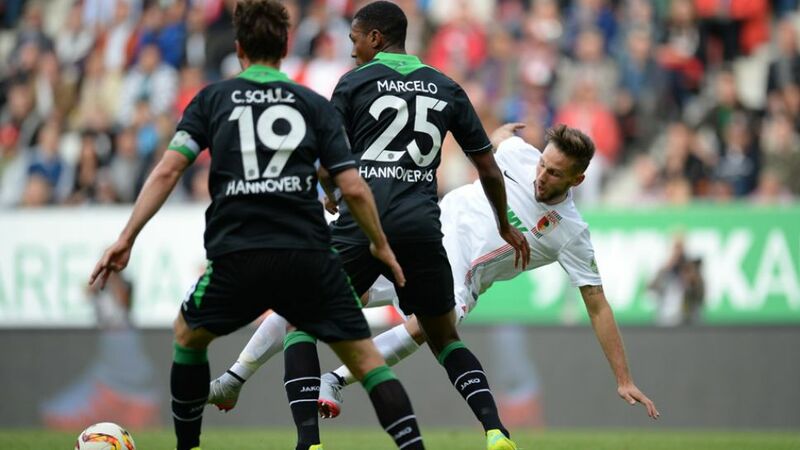 Augsburg - FC Augsburg put an end to their poor start to the season by recording their first victory of the campaign with a 2-0 victory over Hannover 96. The hosts had failed to score in either of their first two home games this term, but began strongly here in an effort to gain the upper hand against a Hannover side that had likewise stumbled into 2015/16. Chances were a rarity early on, but Alexander Esswein gave Augsburg the lead they deserved on 29 minutes with an outstanding curling strike from the edge of the area. They doubled their lead minutes later when Paul Verhaegh converted from the penalty spot after Hannover defender Marcelo brought down Tobias Werner with a clumsy challenge. With the onus on the visitors to score in the second period, Augsburg sat back more but home keeper Marwin Hitz was never troubled by a blunt Hannover attack, allowing the Bavarians to celebrate a maiden league triumph this term. There can be no doubt that Augsburg attacker Tobias Werner is one of the league’s unsung heroes, constantly performing at a high level but without ever grabbing headlines. He was excellent again here, unnerving the Hannover defence with his direct running and clever movement, and it was he who won the penalty from which Augsburg scored their decisive second. Five games played, one draw, four defeats, four goals scored and #12# conceded: Hannover are out of sorts and low on confidence at present. Indeed, that return represents their worst Bundesliga start for over 30 years. Six of Esswein’s nine Bundesliga goals have been the all-important strikes to put his side 1-0 up. He has now scored twice in eight days, having previously scored just once in the preceding 20 months!Verhaegh has scored three of his 11 Bundesliga goals past Hannover keeper Ron-Robert Zieler, all of which have been penalties.Ja-Cheol Koo covered more ground than any other player on the pitch, running a total of 11.6 kilometres.